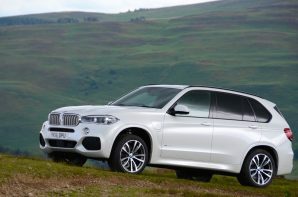 The BMW X5 introduced the world to the concept of a high riding BMW, and the world said Ja! As a result SUV’s have been added to the line-up at a dizzying rate moving rapidly from niche to mainstream purchases. High volumes and high roof lines are a bad combination when you have to hit mandatory CO2 limits, so it is understandable that BMW has put its plug-in hybrid system in the X5. The system in question mates a space efficient electric motor housed within the 8 speed automatic gearbox with a 4 cylinder TwinPower turbo petrol. A modestly sized 9.2 kWh (gross) battery completes the setup. Despite fitting a larger battery the considerable kerb weight and SUV aerodynamics mean that the electric range is officially 19 miles which translates into somewhere between 11 – 19 miles in the real world. Helpfully BMW has published guide mpg’s for longer journeys too to help customers decide if the system will work for them. Based on electric running over the first 19 miles journeys of 31 to 37 miles can achieve 43 to 47 mpg (152/139 g/km); beyond that BMW quote a total range of 516 miles with 26 mpg (252 g/km) likely. So should you consider the plug-in X5? Well if you regularly travel less than 19 miles between potential chargepoints you could make maximum use of the electric range netting big fuel cost savings and achieving genuinely low CO2 emissions. Beyond that journeys up to 40 miles can be dispatched with good fuel consumption, but keep going and the prospect of 20 something mpg looms large. It is a shame that the electric range isn’t closer to 30 miles rather than 11+ miles as we think 30 miles would provide 100% EV running for most people most of the time. However if the current range fits your daily routine the X5 is the pick of plug-in SUV’s combining a decent driving experience with a typically well laid out and screwed together interior. Please note that CO2 emissions quoted for electric cars are not directly comparable to diesel and petrol cars. This is because CO2 emissions quoted are calculated by Green Car Guide and include the emissions created at the power station turning fuel (e.g. gas etc) into electricity and in transmitting and distributing the electricity to an end user. They do not include the actual production of the fuel (e.g. gas extraction and refinery emissions). Petrol and diesel emissions are supplied by car manufacturers and are based solely on the fuel burnt in the engine (tailpipe emissions) and do not include the production of the fuel or distribution to a fuel station. In practice this means that electric car emissions are over-estimated relative to petrol and diesel. For instance if an electric car, a petrol car, and a diesel car are all reported to emit 100 g/km CO2, the electric car actually has lower emissions.